Obesity in the United States has continued to be an issue, and recent studies have begun to show this is an unfortunate trend among pets as well. As veterinary researcher Dr. Kirk Breuninger reported to CBS News, “Overweight and obesity in our cats and dogs has increased by 160 to 170 percent.” It can be challenging not to give in to the adoring eyes of our furry loved ones, but this can have some pretty negative effects over time. We always want to treat our pets and give them the love and attention they deserve. 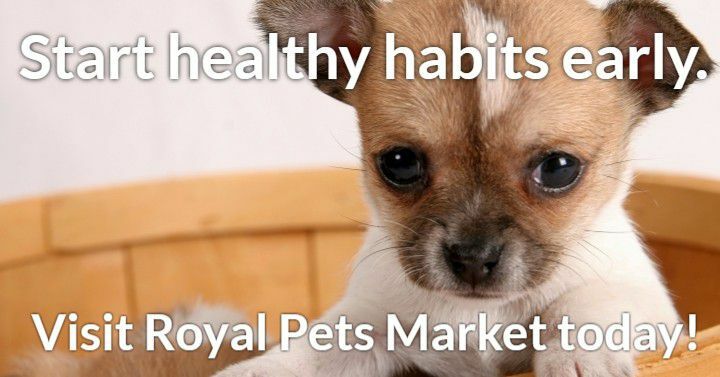 At Royal Pets Market and Resort, we know there are ways to spoil our pets without harming them. Take a look at some of the causes and solutions that come from dealing with pet obesity. A 2016 study on U.S. Pet Obesity showed that 54 percent of dogs and 59 percent of cats are overweight or obese. While these may just look like random percentages, this means that over 1 in 2 dogs or cats are overweight or obese. Because dogs especially vary in what appropriate weights are (based on breed), veterinarians rely on a 9-point scoring system to determine if a dog is overweight. A dog that is a “1” is considered very thin, whereas scoring a 7 means a dog is overweight and a 9 is obese (the ideal body score is a 5). One of the biggest ways to tell if your pet is overweight comes from looking at them from above. As Pet Education states, “The animal should have a definite waist behind the ribs… if there is no waist, or worse yet, the area between the ribs and hips is wider than the hips or ribs, the dog or cat is grossly overweight.” If you’re unsure if your dog or cat is overweight, schedule a veterinary appointment at one of our Royal Pets Market locations. A common, yet misleading, belief about pet obesity is that it simply comes from overeating. There are several other factors that play into the growing epidemic of obesity amongst pets, and the reasons might be surprising. Portion Control. Many pet owners might think they’re doing an excellent job with feeding their animal, appreciating that they don’t give their animal food scraps or additional treats. However, a dog or cat might still be gaining weight if they are receiving more food than normal. Check the food you buy for your pet to see what the recommended serving is. Remember that most breeds of dogs should be fed only twice a day. Treating Like Family Members. This has been an increasing trend over the past few decades. At one point not too long ago, dogs were primarily kept outside. Animals first began being domesticated for work purposes, such as for herding, hunting, or protective practices. In more recent years, dogs and cats alike are kept indoors more often than not, and their growing proximity to their human counterparts has quickly adapted pets into becoming members of the family. When animals are viewed as a part of the family, it’s more common for them to be given special treats, or food from the dinner table. Not Enough Exercise. Lack of movement is an incredibly bad habit that has become unfortunately prevalent for many Americans. This in turn affects the pets we have—our lack of movement means our domestic friends are also not getting enough movement. The benefits of maintaining a healthy weight are astronomical, not to mention, very similar between humans and pets alike. Pets will face far less health problems, and have a much better life expectancy with a healthier weight in check. For each of the causes listed above, the flipside are great practices for not only for pets, but humans as well. Work on getting your dog outside as much as you can, taking for at least a 20-minute walk each day. Use strings, yarn, or other toys to get cats moving as well. Just like for people, a treat is OK every once in awhile, but “treat” indicates a special occasion. Avoid giving your dog scraps from the table, even if their eyes are boring pangs of sympathy into your soul. Work at getting your dog toys that will get them moving, like the wide selection of movement-focused toys we feature at Royal Pets Market and Resort! Stop by one of our Tampa locations today!